CPQ or Configure-Price-Quote tools offer multiple benefits to users. This morning I saw an article that listed the top 10 or so solutions, and I wondered how effective CPQ solutions are in reality. Lots of hype, lots of trade-journal coverage, but, I wonder if companies are really taking advantage, and are they finding a demonstrable advantage using CPQ software? Obviously a CPQ solution must impact things like error rates associated with pricing and configuration. It also should make it easier to respond to RFPs expeditiously. It turns out that Aberdeen has done quite a bit of research on this subject, and their findings are quite interesting. Let’s look at some critical areas and see what the impact of a CPQ solution is on sales performance. One of the most frustrating parts of being in marketing is in the area of lead generation. There are all kinds of ways to qualify a lead, and the fact is, a market-qualified lead is indeed different from a sales-qualified lead. Nonetheless, when you work in marketing and you come across a prospect who is interested in your product, it’s a big deal. Most marketers work with lists of prospects and audiences defined by some criteria; they rarely get to talk with individual prospects. When we do get to have the one-on-one and we will feel as though the prospect is highly qualified, we can’t wait to hand it over to sales. In our hearts, we know these guys will buy! The fact is, those reasons may all be true. But regardless, lead conversion is about as critical as it gets when you are talking effectiveness of marketing and effectiveness of sales. Aberdeen’s research reveals that lead conversion rates for users of CPQ software run about 8.2 times higher than those companies not using a Configure-Price-Quote tool. Buying products means something entirely different than it did a couple of generations ago. The old world of buying meant you slapped down a fixed amount of money and you took title and possession of whatever it was you were buying. Then someone had the bright idea of renting stuff to end-users. This was followed by capital and operating leases, and finally we are now subscribing to product usage. It doesn’t matter if you are talking software, hardware, dump trucks or liability insurance. Your access to a given product is under a usage contract driven by access parameters like numbers of people and physical addresses. These selling models are quite profitable for companies, but they must actively and resolutely pursue the renewal business. You can’t just expect customers to re-up. How is this affected by CPQ? 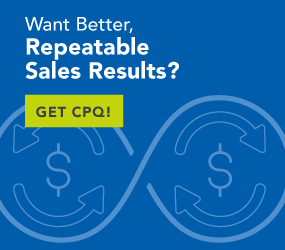 Aberdeen finds that companies using CPQ software solutions experience seven and a half times higher renewal rates than companies not using CPQ. This is what most folks think about when they hear about Configure-Price-Quote tools: complicated pricing and product specifications rendered understandable with tablet computers and CPQ software. The fact is, that is not necessarily a wholly inaccurate perception. Products are complex, and pricing schedules and models are far more complicated than before. This is especially true when you are talking about multiple models, discount schedules, purchase, lease, rental and subscription options all being available. CPQ software has provided great advantage to companies that struggle with this complex reality. Aberdeen research shows 1.6 times reduction per year in contract and pricing mistakes associated with final contracts and proposals. It’s an interesting report and well worth your time to download and read it. We‘ve just covered a few points revealed by the research conducted by Aberdeen. The fact is, companies using Configure-Price-Quote tools do realize significant benefits over their non-CPQ-using competitors. Download your copy of the Aberdeen report on CPQ.